plot summary: In Dead Zone, the evil alien known as Garlic Jr. seeks to gather together all 7 fabled Dragonballs in order to be granted the gift of immortality. His goons carelessly drag young Gohan along with them as they steal his Dragonball on his hat. Little do they know, Gohan is the son of the World’s Strongest Man, Goku! Goku quickly tracks the villains down but arrives too late; Garlic Jr. has already been granted immortality and can never be killed. Goku’s pal, Krillen, and his then-arch-nemesis, Piccolo, join in the fray but find that Garlic Jr. is no easy challenge. plot summary: Oolong steals Bulma’s Dragon Radar, and discovers that someone is gathering up the Dragon Balls. He and Gohan go into the Zulmaizubri Mountains in time to see Dr. Kochin summoning Shenlong and wishing for Dr. Uiro’s lab to be released from the ice. Piccolo arrives to save Gohan from Kochin’s Bio-Men (that look surprisingly like cyborg versions of Nappa’s “Saibai-Men”), but the Demon King is overcome by 3 mysterious figures (Gohan and Oolong escape). Later, Kochin goes to Kame House and kidnaps Bulma in order to force Kame-Sen’nin to go with him to the lab. plot summary: Goku, Gohan, and Kuririn go on a camping trip, and are attacked by Coola’s henchmen. Coola wants to fight Goku and discover the true strength of the legendary “Super Saiyan” that supposedly killed his brother. Coola shows off transformations similar to Freeza, taking it one step further (a fifth transformation that Freeza did not have). plot summary:The movie begins on the new Planet Namek, with the Namekians peacefully going about their daily activities. Suddenly, an “eclipse” of sorts takes place, as a gigantic planetoid spreads out and attaches itself to New Namek. The planet is soon overtaken by robots, enslaving the people. Back on Earth, Dende (the Earth’s new Kami-sama) senses the danger on the far-away planet. Goku and his friends set off in a spaceship for New Namek in order to help. plot summary: Dr. Gero is attacked by Artificial Humans 17 and 18; against his own wishes, he has resorted to activating them in an attempt to kill Son Goku and his friends. Unfortunately, they are more powerful and aware than he had anticipated, and turn against their master. #17 decapitates Dr. Gero, and crushes his head. Elsewhere in his laboratory, we see Dr. Gero’s blood dripping down into a room with a computer still working hard, hooked up to three more giant capsules large enough to hold a person inside. The numbers on them read out 13, 14, and 15.
plot summary: Mr. Money is sponsoring a new style of Budôkai as a present for his son’s birthday. He has invited aliens to compete in the tournament. Gohan, Trunks, Tenshinhan, Yamcha, Kuririn, and Piccolo battle their way (or don’t battle their way!) to the semi-final rounds, only to find that the alien guests have been killed by a new foe: Bojack. Bojack was originally sealed away by all four Kaiô when he tried to take over all of the galaxies; however, with the Northern Kaiô dead (thanks to Cell, and Goku’s not-so-quick thinking), the seal has been broken, and Bojack has chosen Earth as his new home. plot summary: Brolly’s Space ship crash lands into earth a little while after the events in film 8 where a malfunction causes him to stay in suspended animation, 7 years pass and Goku passes on into heaven after the events of the Cell Game, Brolly reawakens and causes chaos and havok as he tries to locate Goku, it’s up to Gohan Goten and Trunks to stop him this time. plot summary: The millonaire Jaguar reveals his greatest weapon: a Super Bio-Fighter. But when Trunks and Goten see the Super Bio-Fighter, they recognize him as none other than the Legendary Super Saiyan himself, Broly. 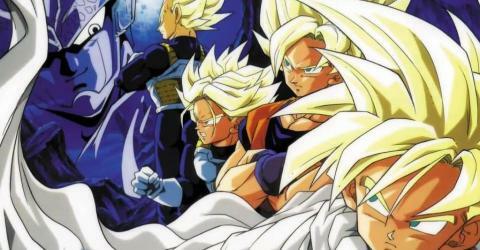 They confront the priest, who tells them that he sold Broly’s frozen blood to Jaguar, and that the Bio-Broly is Broly’s clone. Trunks and Goten prepare to destroy Bio-Broly before he can be revived, but seeing Goten has already awakened Broly’s Saiyan instincts. He breaks out of stasis, only to be drenched in the bio-liquid and turn into a horribly deformed bio-mutant, giving him the name Bio-Broly. plot summary: In the Other World, Son Gokū and Paikuhan are sparring, but are called to go to Enma Daiō and see what’s going on. When they arrive, they find that Hell has been changed into a colorful, weird world filled with colorful stones. Enma Daiō has been imprisoned in a barrier, and the teenager has been mutated by the spiritual waste into a big ugly monster named Janemba. Paikuhan attempts to break the barrier, and Goku begins fighting the monster. The monster has strange powers that allow him to defy reality(such as creating a portal to punch through that leads right to Goku), and even as a Super Saiyan Gokū is losing. He then powers up to Super Saiyan 3 and can defeat the monster, but it’s not enough and he fuses with Vegeta. plot summary: The movie begins thousands of years before the main plot of series. On Konats, planet in the southern galaxy of the universe, a group of black magicians, the Kash-phar, use a spell on a statue to bring the monster it depicted to life. The monster, Hirudegarn, immediately goes on a rampage, killing everyone who tries to get in his way and devastating the planet. Two young heroes, Tapion and his brother Minoshia, manage to freeze the monster in his tracks by each playing their divine ocarina, giving a priest the opportunity to cut the monster in half with a divine sword. Since Hirudegarn can’t be killed at the time, his upper-half is sealed in Tapion and the other half in Minoshia. However, fearing that the monster might reappear someday, the brothers are separated, each sealed in a music box, and shot into opposite ends of the galaxy. The music box holding Tapion lands on Earth.Kash-phar, becomes determined to resurrect the monster to rule the universe. He releases Hirudegarn’s lower half on a distant planet and easily disposes of Minoshia, who is crushed under the feet of the monster. On Earth however, Hoi switches to a more tactical plan. He starts by spying on a boy and a girl who are fighting crime in a city on Earth. The boy and the girl are none other than Son Gohan (as the Great Saiyaman) and Videl. Soon after, they are summoned from their school to rescue an old man who wants to commit suicide. When Gohan and Videl enter the scene, they encounter the same man who had spied on them. After rescuing him, Hoi tells the two about the legendary warrior Tapion. 49. Elite Fighters of the Universe. 59 – Gohan! Defeat Your Dad! 64. Fighting Power: One Million? I RETURN!!!! JOSH IS BACK!!!! SO THE WEBSITE SHALL ROCK ON!!! Categories: All new news . . Author: Josh . Comments: Comments Off on I AM BAAAAAAAAACKK!!!!!!!!! Hello everybody, I have made a pack of some commonly searched items of Dragonball Z.It is really good for Dragonball Z fans.Click here to download it.Have a look at it..